Games used to be hand-crafted and predictable. You played them, you beat them, and if you played them again, the content would stay the same. Nowadays, there’s a trend towards dynamic content: if you play the same game twice, the experience could be radically different the second time through. What’s with the recent interest in procedurally generated content? How did we get here? And is it good for gaming? Generally speaking, procedural generation is the creation of content according to the parameters of an algorithm rather than through manual creation by hand. In even simpler terms, it’s the process of creating content using nothing but code. In the context of video games, “content” can refer to a wide range of things: sound effects, music tracks, art textures, object models, world terrain, enemy placement, character advancement, and more. The key to these procedural algorithms is that they often include some element of randomness. Doing so ensures that a handful of input parameters can generate a wide variety of output results, which can help increase a game’s replayability since the content will be different on each play through. Due to memory limitations in the early history of video games, content often had to be generated through algorithms — unlike modern games which can utilize dozens of gigabytes in high-quality assets. While most early games relied on some form of procedural generation, one of the most notable examples is Rogue. Rogue‘s claim to fame can largely be attributed to two factors: 1) its use of ASCII characters to draw visual elements and 2) random generation of dungeon layouts and object placements. The result is a near-infinitely replayable experience where no two games were ever the same. Tetris probably isn’t the first game that pops to mind when someone mentions procedurally generated content, but depending on how strict you want to be with the definition of “procedural generation”, it does fit the bill. Prior to Tetris, puzzle games 10 Websites For Playing Free Jigsaw Puzzles Online 10 Websites For Playing Free Jigsaw Puzzles Online Read More had a single solution to be reached through manipulation of the available pieces. Despite the retrospective simplicity of the gameplay in Tetris, it offered something no puzzle game had offered before: an endless stream of randomly selected pieces with no victory condition. The impact of Tetris can be felt to this day. Some of the most addictive puzzle games of our time — e.g. Bejeweled, Candy Crush, 2048 — have randomized elements that couldn’t be replicated in a non-video-game format. These games couldn’t exist without procedural generation. And that’s not even to mention the continuing popularity of Tetris itself. 16 years after the release of Rogue, Blizzard Entertainment debuted a game that ended up bringing the roguelike genre into the modern age: Diablo. This action-based RPG The Top 5 Alternatives To Diablo 3 [Gaming] The Top 5 Alternatives To Diablo 3 [Gaming] Diablo 3 is out. The game hasn’t pleased everyone. Some gamers feel it doesn’t live up to the legacy of the Diablo franchise while others are just mad about the DRM. If you’re in the... Read More implemented procedural elements so well that fans sank hundreds — even thousands — of hours into the game without growing bored. Diablo did a lot of things right, but as far as procedural generation goes, it popularized two specific gameplay elements. Random dungeon layouts. Just like Rogue and all of its clones, Diablo generated dungeons according to an algorithm with random elements, but it took the process one step further: instead of simply matching ASCII characters, Diablo‘s dungeons were made using 2D isometric graphics. Random item generation. Diablo applied elements of randomization to its item system as well, pioneering a type of gameplay that’s still common today. Not only were items categorized by color-coded tiers of rarity, each item’s stats were generated on-the-fly at the moment of creation. 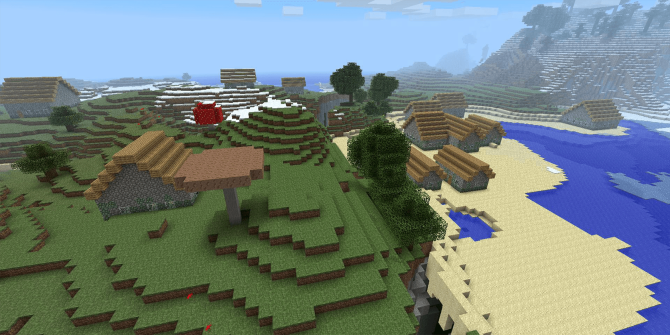 While procedural generation has been around for a few decades now, it’s hard to deny that the modern craze in procedural content finds its roots in the popularity of Minecraft. Indeed, Minecraft is proof that a game can be compelling even if it has no hand-placed content whatsoever. This truth paved the way for many indie game developers. Procedural generation greatly reduces the cost of content creation, allowing solo developers to put out content-rich games without necessarily pouring thousands of man-hours into item, level, and enemy design. The code can handle all of that. That’s why these past few years have seen a revival in the indie gaming scene 10 Indie Games So Good, You’ll Forget They’re Indie At All 10 Indie Games So Good, You’ll Forget They’re Indie At All There may be times, however, where you want something different from the indie norm. A game that follows indie values, yet is made with the quality that top-shelf AAA games are known for. Titles like... Read More . Titles like The Binding of Isaac, Spelunky, and No Man’s Sky all incorporate “roguelike elements” (a term synonymous with “procedural elements”) to great success. Would these games exist today in their current capacity if Minecraft had never debuted? Maybe, maybe not. Regarding procedural indie games, one game deserves special mention. Often cited as the deepest video game of all time, Dwarf Fortress has hundreds of interrelated procedural systems that result in complex gameplay 4 Games With Steep Learning Curves That Are Worth The Effort 4 Games With Steep Learning Curves That Are Worth The Effort Learning competitive games is no easy task. If the act of mastering them was easy, everyone would be playing professionally. However, even if you might never make it to that high level of play, you... Read More that’s incredibly rewarding. No other game has this much procedural depth. It’ll be interesting to see where the procedural fad goes from here. Have we seen the end of it? Or is the trend still in its infant stage? I personally think we’ve only walked the foothills of this mountain and I’m excited for the future of gaming. What other influential games with procedurally generated content are out there? Which procedural elements do you like best and which ones will keep you from playing a title? Share your thoughts with us below! The original 'Elite' on the BBC Micro (1984) is an important early example of 'universe generation' by procedural means. I remember building my first Pentium-class PC - a Cyrix 6x86/133 - to play Diablo. Oddly enough, the town and several levels towards the end of the game (lowest levels of the dungeon) that are always the same, as well as several dungeon segments that always appear on certain levels (the rest of the level is random, built around the quest).